So You Think You Know Matzo? In the beginning, there was dough. When Egypt's pharaoh finally agreed after much convincing (and 10 plagues) to let Moses' enslaved people go, the Jews left their homes so quickly  pursued by the pharaoh, who by then had changed his mind  that they didn't have time to prepare bread for the journey. Instead, they ate an unleavened mixture of flour and water that, when baked, turned flat and hard. Passover began on April 8 this year, and for the next eight days, Jewish people all over the world will remember their exodus by forgoing cakes, cookies, pasta and noodles  anything made to rise with yeast, baking soda, etc.  in favor of the only bread product they're allowed: matzo. In 1838, a Frenchman named Isaac Singer invented a matzo-dough-rolling machine that cut down on the dough's prep time and made mass production possible. But changes to 3,000-year-old religious traditions never go smoothly, and Singer's invention became a hot-button issue for 19th century Jewish authorities. In 1959, a well-known Ukrainian rabbi named Solomon Kluger published an angry manifesto against machine-made matzo, while his brother-in-law, Rabbi Joseph Saul Nathanson, published a defense. Jewish communities around the world weighed in on the issue  arguing that handmade matzo provided kneading jobs for the poor; that the machine made matzo cheap enough that poor people could afford it; that the mitzvah, or good deed, of eating matzo was ruined if a machine was used; that the machine made it easier to abide by the 18-minute rule. These discussions were not resolved quickly  and in some Orthodox communities, not at all. In 1888, a Lithuanian immigrant named Dov Behr opened the first matzo-making factory in Cincinnati, Ohio. Behr adopted the name Manischewitz, named his factory the B. Manischewitz Company and developed an entirely automated method of matzo production. In advertisements, Manischewitz boasted that "no human hand touches these matzos!" By 1920, he was the world's largest matzo producer  at 1.25 million rectangular, sheetlike matzos a day  but he always adhered to the original kosher rules. As Manischewitz's popularity grew, so did the general perception of matzo. Gone were the lumps and bumps of homemade mazo; machine-made mazo was uniform in size, shape, taste and texture. Manischewitz endured some controversy for his use of machines, but after he spent 13 years studying the Talmud in Jerusalem, even the most hardened traditionalists eventually considered him an acceptable authority on matzo. The Manischewitz family sold the company in 1990 for $42.5 million; the brand is still the most popular type of matzo in the world. Other machine-made-matzo companies sprung up around the country, and by the mid20th century, matzo was available in nearly every grocery store. The crisp, crackerlike bread became popular with Gentiles, and soon companies were producing flavored matzo, spiced matzo and matzo covered in chocolate. Organic and gluten-free versions of the food are now available for those who don't consider the unleavened sheets healthy enough. "People started buying flavored matzo year-round sometime over the last few decades," says Alan Adler, director of operations for the family-run Streit's, which has been operating out of the same Manhattan location since 1925. Streit's offers every kind of matzo, from unsalted to sundried tomato, although Adler says the Passover-approved matzo  supervised by rabbis holding stopwatches to monitor the 18-minute rule  is still the most popular. "For the bad rap it gets at the holiday as being the bread of affliction, I guess it's still pretty good." 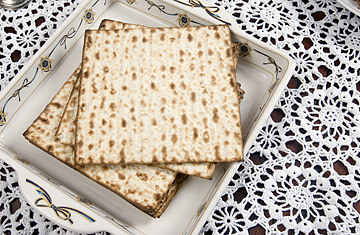 But despite the technological advancements and added flavors, matzo still remains a food steeped in religious tradition. At Passover Seders, families retell the story of the Jewish exodus from Egypt, eat matzo plain and then with a fruit-and-nut concoction called haroseth that symbolizes the bricks and mortar the Jews had to prepare as slaves. Sometimes parents hide a piece of matzo  called the afikoman  and reward children with money or gifts if they find it. But when the eight days of Passover are over, it's back to the world of starchy carbohydrates. See videos of people finding God on YouTube.